Click the Real Audio symbol to listen to the statements with the free Real Audio Player G2. The Real Contribution to Sustainable Development"
The discussion reflects general statements from a variety of backgrounds and perspectives with statements concerning local, regional, European, and global levels. The following documentation offers a complete record of the panel discussion. 1. Intro-statement Nick Hodges: "The aim of Telematics should be to raise the awareness of administration, politicians, technical staff and the public and to implement choice firstly by the public and secondly by the infrastructure"
As an example Nick Hodges sketched the situation of Leicester and the experience made with traffic demand management. Leicester is situated in the east midlands at the M1 motorway from London to the north; 400.000 inhabitants including the suburbs areas; Leicester was the first UK Environment City which was a challenge to act in an eco-friendly way. 1996 Leicester won the EU´s Sustainable City Award. NH presented a dispersion model with meteorological parameters (inversion layer) includes the motorway and shows hot spots near the city center (using AVIRO eulerian grid dispersion model) The model is supported by live emission data, live demand responsive traffic control data. Using active Traffic control it was possible to give priorities to some routes. So it was possible to relocate traffic queues to an open area. The pollution load was not reduced, but located to a more rural area. The politic dimension started due to its area was in other authorities area. Regarding to this fact the question has to be raised who is responsible for the emission (e.g. are commuters from the city's vicinity responsible for the pollution). An alternative would be to brief the public and encourage them to come by public transport (rail or bus) In an experiment with road tolling or a park and ride system with offering a quality bus it turned out that travel time by bus is 10 min, by car 25 min for the same distance. Munich has a 15year tradition with environmental information. The City Council encouraged to have environmental information for the public and for institutions. In the beginning, print media were used and an information office (Umweltladen, up to now) was established. Using telematics, a new era begins in terms of public information, also the EC esp. the TAP Programme enabled new possibilities. Better knowledge about the environmental situation and information for public, administration and also institutions with better opportunities for information exchange. A legislative basis ensures the right of environmental information for the public (Rechtsanspruch, approx. since 1993). Telematics is the main tool for fulfilling the legal framework on public information. (data acquisition, data management, data dissemination, Internet, Intranet, info-kiosks). Telematics will help to raise public awareness and serve also as a tool for decision-makers (within the local authorities). Telematics has to be a tool for improving the environmental situation and should not be developed as tool without keeping the objectives in mind. Transport Telematics solutions may cause problems due to relocating of traffic and relocating of traffic queues, often followed by the relocation of noise and pollution emission. Improving City-networks on a national and on an international scale, the European Union has an important role in the development and implementation of Telematics Solutions. Telematics is a voluntary action in Munich! Problems exists due to the lack of personal resources within the city administration. Munich solves the problems partly with participating in EU Programmes. Problems for implementation in Lithuania is that there exist no rules and no established procedures for providing environmental information. The public is not informed - or cannot be informed - on how they can access environmental information. Moreover, there exists only a low quality environmental information because there is a long delay for publishing environmental data. Most environmental information is restricted to reports on paper. A face to face communication is often needed to retrieve environmental information. In Lithuania the lack of funding, the lack of institutional cooperation, relatively low expertise in the field of IT are the main obstacles that have to be overcome in the future. Raising awareness about telematics issues would also raise public awareness. This would support environmental management in general and support sustainable development. Telematics should be a tool for the dissemination of environmental information and never become a goal itself. Attention and funding for the development and implementation on telematics should be given in a good proportion with other actions to maintain the principle of sustainable development. The main tasks to avoid destruction by floods is preparedness and appropriate flood prediction. The total length of rivers within Bavaria is about 6000 km. The level situation is observed by gauging stations and this parameters are combined with meteorological data from the German Weather Service (DWD - Deutscher Wetterdienst) and with other parameters (such as topographic data). Telematics help in modelling and simulation of flood and is also a tool for landuse and landplanning. Finally it is a tool for political decisions. After a long and almost never-ending discussion about the new planned route for the track of the ICE (Inter City Express) from Munich to Nuremberg a digital noise chart helped the council to make a final decision about the rail-track. A well established technical infrastructure to improve the communication between administration and institutions. An improved data exchange is necessary for decisions making. For an appropriate use of Telematics a training is necessary to have the benefit of environmental information. This training has to include all levels of the staff even up to the Minister. The Interface is one of the most important issues. Only a user friendly Information Technology will be accepted and broadly used and can be used as a service for the citizen. Raising the awareness of the use of telematics and its possibilities is also necessary even for high level authorities and politicians. Telematics is a tool that became more powerful within the last years and helps the public, the administration and the political decision-makers to create a more sustainable politic. 5. Intro-statement Franz Josef Radermacher: "If we are honest we are not on the way to a sustainable Society, we are on the way to a more and more unsustainable Society. We just use the word "sustainability" for marketing reasons." "It is necessary to take a much broader view and - for the essentials - recognise that we only can be as sustainable as the world market allows us to be sustainable. We have to be competitive with the partners we have, also with global partners. We do not have the choice. How can we contribute to a global sustainable development? We are even in danger to lose the benefits that we have already reached. E.g. the liberalisation of the energy market - which is a consequence of the world market pressure - causes that the combined electricity/heat production cannot be financed any longer. Financing it can often be done only under a monopoly. Is becomes harder to finance reasonable things. A lot of money is used for social infrastructure. Problems may occur with the step out of atomic energy for Germany. The power is then generated in the Ukraine or in France and traded from there." The global view of development and sustainability has always to be kept in mind. "We have so much of that narrow local view instead of what we need under a broad world wide view. The environmental question and the question of sustainability will be decided world-wide and not only in Europe. The real powerful drivers will be e.g. India and China by starting doing what we now already do." Many of our solutions are eco-efficient but under a closer view they are not solving the problems. They often even create greater problems. Example: Road Traffic Management systems: The better traffic management systems are handled the more capacity is given to existing traffic infrastructure as more traffic will be the result. Example: Air traffic Management system: Air travel time can be reduced by the use of air traffic management systems. The use of fuel will increase, free capacity will be used for more flight connections. As a result the market will drive the price down and finally there will be more air traffic as it was on the starting point. "The question is :What can be done, what can Cities do?" The Local Agenda 2000 is a good opportunity, but not in the way to save the world locally but to built new partnerships especially with developing countries. A suggestion is that every European town should have a partnership town with at least five time as many inhabitants. 20 % of the city budget should be used in the partnership region. This Global Cities dialogue would help to work on global solutions and would strengthen the network with others regions. CO2 emission can be addressed world-wide. That means instead of using a lot of money to have a little impact here, it is more efficient to use the money equivalent in China, India or other developing countries. That would also be part of the contract for cleaner production mechanism. This deals should not be misunderstood as "buy us out". We have to "buy us out" much more than now. We will have to spend more for social and environmental development around the globe. That will be the only chance to get things better." 6. Intro-statement João Ribeiro da Costa: "What is sustainable development?" João Ribeiro da Costa pointed out that sustainable development implies predicting the future. From the past we see that a lot of predictions concerning the environment were wrong. It is clear that sustainability is a global affair and not an affair of a single country. Keeping in mind that sustainable development implies prediction and is global we can resume that sustainable development is a massive task. The solution of this task depends on the action of each of us on a local basis. Here telematics apply. As an example, Telematics means to have a network that connects people to the whole world. For the first time ever it is now feasible for us to act locally and to contribute on a global level. The only way to have sustainable development is to apply telematics at a local level and to combine locally available data on a global level by using available expertise. Siegfried Rupprecht resumed that all statements reflect a variety of backgrounds, and perspectives: on a local, regional, European and global level. 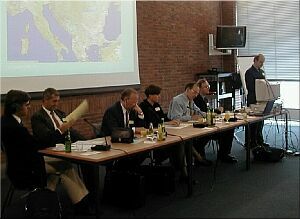 Siegfried Rupprecht encouraged the floor to participate actively in the discussion. Teemu Virtanen (air pollution coordinator for the Helsinki metropolitan area, FI) reacted to F. J. Radermacher concerning the task of delivering technology to developing countries. He stressed the importance of financing better technology in developing countries and promoting the use of better technologies. Teemu Virtanen highlighted the importance to encourage the European industry to contribute to a better environmental situation. He compared the requirement of an improved environmental situation nowadays with the exploit of flying to the moon in the sixties. If we invest in an improved environment we will also have the spin-off effect of the development of new technologies. These new products (state of art technology) should also be used to support developing countries. Horst Kremers required to have more detailed documentation of the results of projects funded by national science foundations or financed by the EC. Technicians from computer sciences need a lot of information about technical details. This information would also be necessary for the implementation of technology on new sites. The documentation of scientific projects is often not sufficient documentations do not compriese all information. Knowledge is not spread widely enough as it would be necessary for a satisfying transfer of already developed technology. Often the contractors do not report sufficiently about the results of their work and the funded projects are not supporting the information society. Siegfried Rupprecht: "What special action is demanded from decision-makers from regional and local levels? What are the demands in the telematics area concerning global networking, and partnership agreements with cities in developing countries? How can the development be changed and how can the development be challenged?" Franz Josef Radermacher: "The main message is : Often the developed solution turns out to be the new problem. That is a historical fact and completely normal. New technologies cause new - and often greater problems and that is the driving force for new technologies with new problems on higher levels." Concerning the statement of Teemu Virtanen and his comparison with the flight to the moon F. J. Radermacher mentioned that computers are responsible for a lot of new environmental problems by e.g. increasing mountains of electronic garbage. That problem is driven by the price-level of electronic gadgets as e.g. mobile phones are nowadays give-aways. "However, every year everything becomes more environmental friendly. "It will turn out as a disaster if everybody on the globe has the same behaviour and uses as much resources as it is done in the high-technology countries." New technologies are only accepted if they are able to deliver new services cheaper as before. That is the real idea of the "eco-efficiency". "Environmental arguments are often used only for marketing reasons. Consumption cannot be the way leading to a sustainable development. Believing in technology is not the way that leads to a global sustainable development." Mr. Radermacher pointed out that it is more important to implement a fair global system for the use of wealth than to believe in technology. Therefore it will be necessary to have a fair way of trading the pollution rights. "After an agreement on that the market will find the best solution for the use of a limited amount of CO2 emissions. That means that we have to take care of an appropriate global market system for selling CO2 emissions. If this framework is set up in a satisfying way, the right of the market will do the rest. Setting up such a framework means also to have limitations in our lifestyle. That limitations will be caused by the limit of CO2 pollution that is available for us. That implies that we accept that everybody has the right to use the same amount of CO2 emissions. E.g. we would have to buy CO2 emissions from other countries. Consumption would become more expensive here and - on a longer view - consumption will also become more expensive there. The consequence will be a social development in developing countries." I suggest that particular actions for towns could be to establish networks with other towns which would influence the global contracts. The benefits would be the support of towns in the south and awareness building for the real problems e. The information of the public about this situation has to be enforced. Stefan Jensen (Ministry of Environment of Lower Saxony, DE): raised the - provocative - question if the EC should terminate their Telematic Programme and use the saved money for a transition programme for Eastern - Eastern European Countries to follow the path that FJR sketched? Maria Kazmukova (Senior consultant in air quality, City Development Authority Prague, ENWAP member; CZ): "Technology is absolutely useful for the global development. Technology is the only way to search for alternative energies. The risk is to impose our way of living to developing countries. That would be the worst thing we can do for them also due to cultural differences. Maybe the new technologies that would be invented can actually save our environment. Technology should be used to reinvent our use of energy. We have to go on in our technologies to find a energy which is more sustainable and more environmental friendly." Ivica Ruzic (Center for Marine & Environmental Research of the Ruder Boskovic Institute, ENWAP member; HR) pointed out that there are two different things discussed in this panel discussion. He described that from his point of view Telematics is not a technology to change or save the environment. Telematics can only be used to exchange our knowledge faster, more efficiently, and cheaper. That causes that we can react faster. Telematics can help to address the public and politicians more efficiently. Telematics does not influence the decision that is taken after the exchange of knowledge. Ivica Ružic mentioned that the knowledge is nowadays collected all over the world and that we want to use this knowledge to make decisions. Telematics can help us to make right decisions. 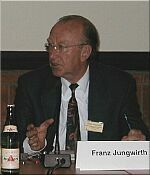 Franz Jungwirth declared that the role of new technologies should not only be seen in a negative way. The development of new technologies offers the possibility of the reduction of energy consumption. To answer the question of the chair of what can be done by local and regional decision-makers: Any decision needs the acceptance of the public. Sustainability starts on a very small and private scale. Only when the idea of sustainability is accepted by a broad public, this public will understand and will agree to decisions on a global scale. Joachim Lorenz pointed out that only the best technology should be transferred globally. The trade of emission rights would not support the transfer of state of the art technology. The trade of emission would support the transfer of old and outdated technologies. Joachim Lorenz pointed also out the importance of the implementation of world-wide standards for emissions. It has to be kept in mind that the implementation will last some time. The implementation of world-wide standards for emissions will also demand the full potential of innovations of our industry and will cause the development of new state of the art technologies. In the experience of the City of Munich with its partnership-town Harare, the capital of Zimbabwe Joachim Lorenz pointed out the possibilities of Telematics to improve the environmental and health situation in developing countries. This improvement can be done by using the whole potential of Telematics for disseminating the information on environmental issues. Telematics will play an important role in building new networks and partnerships - even on a global scale - by the exchange of information across borders and long distances. This loss of distances is necessary to build global partnerships. The development of new high quality technology is important to have the security of a high rate of employment. "We have to save our human and creative capital by the development of new technologies." Nick Hodges mentioned that the benefit for the community itself is important. He pointed out that some transport management systems which work in Europe cannot be transferred to the United States because the cost benefit analysis does not work in the USA due to the low fuel price there. "The transport industry has a strangle hold by that and accepting that strangle hold would be the wrong way." People in the neighbourhood of an industrial location want to have the pollution load of that location reduced and they will not accept the payment of this industry to a developing country with the aim to improve the state of the environment on the other side of the globe. (That means emission trading will hardly be understood by people who are directly affected by pollution). "Telematics can play a positive role in improving the environment: Telematics is a way to bringing information together. It makes us able to simplify data and present them at the appropriate level. That will help the public to understand and that will influence the way that the politicians decide how their community should be organised." Telematics offers also the opportunity for people to change and choose e.g. by using telematics for teleworking or for studying on remote sites. Also high quality employees can stay in such remote or/and rural areas by using Telematics. 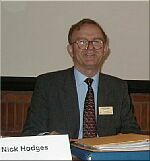 Coming back to mobility, Nick Hodges noted that there is the idea of road users charging. Some people agree to charging and see the benefit of using public transport, some do not. Nick Hodges pointed out the importance of having the choice and this should be a community decision. 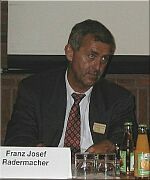 Franz Josef Radermacher said that the Information Society Forum has been working for many years on that issues and Telematics is in the kernel of that work. He sees that Telematics is the big opportunity for a better world, and it is the only mechanism that we have for development in the South. It is said that there is a factor 10 of improvement necessary for the next ten years and that can only be achieved with new technologies and with open markets. Telematics has to be used for economic reasons and not for sustainability reasons. "The question is: Does telematics help for sustainability?" "The answer is: It can help and it can make things worse. The major question is the question about global politics." "If we keep the WTO (World Trade Organisation) global regime or if we even extend it to investments and even extend it to services, if we just stay in the logic that we have now, we will end up all of us somewhere between US and Brazil with a "80-20" social system and we will end up absolutely not sustainable!" "If we want to be sustainable we have to implement a European logic, that means we need a social ecological market system on the global scale, like in the EU with respect to the new accession countries. That means that the richer countries have to co-finance the social and ecological system of the poorer countries. That means we have to invest into co-financing standards systems. The poorer countries can only agree to standards and implement better technologies if that is co-financed, otherwise they will stay on a more unsustainable way. This model has to be transferred to a global scale. The North has to invest much more on a global scale for others to be able to lead them to better standards." "The crucial point is to take money from the richer countries to invest it in other countries for more socio-ecological development. Taking money out here means to pollute less. We have to limit our activities by having things more expensive." "The danger of the idea of building a green world here - in Europe - is to end up in a more polluted world and to have our social system destroyed. I would not be surprised if we would get a two class medicine within ten years, if we get privately funded top universities within ten years. At the moment we are seeing that our most important European achievements are destroyed by world market pressure and our illusion is to save it here. But the only chance is to build a global partnership." It will depend on a European way to a global sustainable Information Society and it will take all the emphasis of our politicians for the next negotiations, e.g. the post-Kyoto, the Millenniums Rounds and of the GATT (General Agreement on Tariffs and Trade). Once these agreements are signed, there is not much we can do any more. With the signatures under these global contracts all our dreams will be destroyed!" 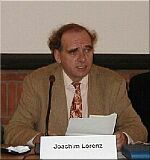 Joachim Lorenz stressed the importance of the dissemination and the export of information out of Europe into all parts of the world. Therefore it is necessary to build networks and partnerships on national, international and on a global level. These partnerships would be necessary to have distances decreased and to have time for the task of information dissemination. Telematics is presently the only appropriate tool therefore. Building partnerships should also aim into new environmental standards. 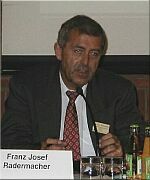 Franz Jungwirth stressed the importance of the dissemination of information and knowledge about how to use this information on a global scale. Regarding to his personal experience with a Chinese partner region, with 8.000.000 inhabitants, he notes that it is very important to transfer only the best technology. That should also be a challenge for timesaving by the implementation of new technologies and by using the already existing knowledge. Besides it is very important to enforce the development and the use of new technologies in a broader way in the own country. Nick Hodges: "Telematics enables us to raise people's awareness and to understand various things. The future lies in a good education of our youth to raise their awareness of impacts to the community. They can make up their mind how they want their community to function and what they feel to be their responsibility towards the "rest of the world". Violeta Kauneliene: "Co-operation in a proper way helps development in general. Telematics has the function of a tool therefore." 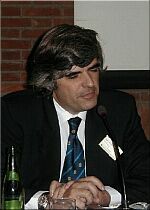 João Ribeiro da Costa told as an example the story of the process of decision-making that happened in 1989: The objective of the Minister of Environment was to decide how to invest money in the textile industry for supporting waste water treatment systems The aim was to improve water quality of rivers. After the Minister consulted a River Information System where the water quality was visualized with all the details about pollution sources, an unanimous decision could be made. Telematics helps locally by improving the decision making process. Having better informed decision-makers will lead to better decisions. Telematics can help to make things more transparent. E.g. if the data are available for everybody on the Internet, public awareness will be raised and politicians will have to respect this fact in their decisions. In both ways Telematics can contribute to a more sustainable development. Wolfgang Boch (European Commission, DGXIII Head of Unit, Information Society Applications for Environment Protection): "The prime issue what we are discussing is change. We want a certain development to change. The question is: What are the driving forces for change? Telematics for itself can never be a goal. It can only be a means to support a goal and to support the implementation of an objective. The whole issue on environmental considerations have been largely - not only in the western world but globally - regulated by regulations. The consideration e.g. for the service market has been driven by regulations. So far in the environment. We have to invest much more in thinking, how can we revise the approach that the service market in environment is driven purely by regulations. The concerns of Mr. Radermacher are who and what are the driving forces on this globe, the driving forces are some rules of economy. If we were in a situation that there are economic driving forces to support voluntary agreements, voluntary actions, maybe there would be a lot of change." "Coming back to the question what is the contribution of Telematics to sustainable development: Telematics offers an infrastructure where new services can be developed for many purposes. There is the issue of becoming more aware, as an individual, as a manage or as a politician." With regard to the early past the costs for Telematics and for the infrastructure are steadily decreasing by getting more advanced and getting more user-friendly. Today it becomes practicable that a Telematics tool for environmental planning purposes - e.g. where to place an industrial development area - can be handled by someone who can be trained in a short period on a tool that runs on a high performance workstation. In the past a cray - machine was necessary for that purpose. In this way things became reality. "My concerns and issues are: How can we change the kind of evolution of driving forces in this process, and there we have to see how to make best use of the Telematics options. Telematics is not an answer to our problems but it offers options we should try to make best use of it." 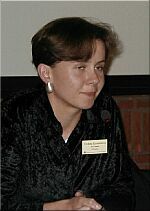 Maria Kazmukova: "Technology transfer and the transfer of Telematics helps. Telematics is necessary to understand the data which are available and to understand the consequences of our decisions.It is necessary to have easy access, better dissemination, better understanding of the Information Society Programme." She pointed out the role of the ENWAP User "handbooks" ("User Requirements in Air and Water Management Systems" and " Good Practice Cases in Air and Water Management Systems for Europe") "The documents about the results of the Information Society Programme would increase the technology transfer and help the people in Europe to choose the appropriate technology. It should give the information what can be done by Telematics."